Humanity has been subject to the ebb and flow of the natural cycles of Earth since the dawn of our species. From that time, our destiny has run parallel to that of the humble yet ever important seed. However, In today’s chaotic and self destructive “society”, dominated by the grizzly specter of war, corporate greed, and governmental restriction; we have lost our connection with nature and with it, our understanding of the importance of the seed. T.J. Mabrey, a Texas sculptor, explores these issues in her current exhibition at the Croft Gallery in downtown Waco. Her work expresses the beauty and symbolic relevance that the seed and the pod have represented throughout history across cultures. She expresses humanity’s socio-political connection to the seed while concurrently connecting the symbolism of the seed with the stars through the context of the world tree, an ancient cosmological archetype that is and has been shared by shamanic cultures across the world. Many of such cultures still exist in third world countries. Being very much connected with social activism, Ms. Mabrey uses her work to bring an awareness of Genetic Use Restriction Technology (GURT) also known as Terminator Technology that is produced by agri-corporations such as Monsanto. This abomination to nature is currently being used in first and third world countries to create “terminator seeds” which have the potential to enslave humanity to the whims of corporate interests at best or create global famine with massive death tolls, unfathomable misery, and ecological disaster yet unseen in Earth’s long history at worst. The dangers of such things are brilliantly expressed in such pieces as “Winter’s Lemon”, “Control”, and “Intertwined Pods”. The piece entitled “Control”, speaks of exactly the situation described above the loudest. When one comes upon it, the viewer encounters a clear plastic drape. On this petroleum ground, the observer finds hazel nuts filled with condoms arranged in a pattern that spells “control”. This is the one piece in Mabrey’s current exhibit that is not meticulously sculpted from a block of marble or cast in bronze. Lacking the traditional beauty possessed by her other pieces, it is still rather witty and adds an interesting stylistic dynamic to the rest of the exhibit nonetheless. There is a classical aesthetic in T.J’s work. 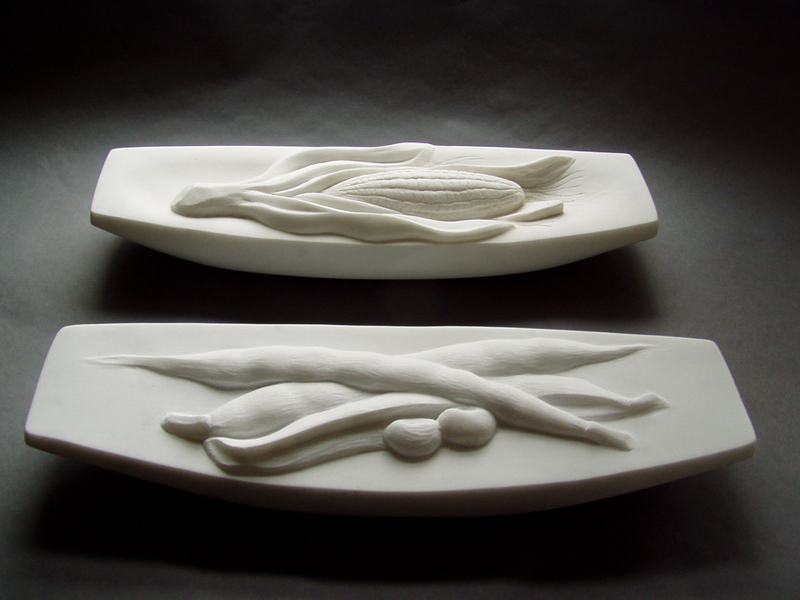 The majority of her sculpture is done primarily in marble using traditional methods and tools. One is reminded of classical Greek sculpture of fertility deities all throughout the experience of viewing her work. The sculptures seem to be crafted with the same spiritual reverence, focus of mind, and steadiness of hand as the classical Greek masters. There is definitely a mystical element to her work as well. It seems she explores the mysteries of life and hidden potential that the seed embodies and relates it to the heavens; dwelling place of the stars, and home of mythological figures. Likewise, there is a strong sexual tendency apparent in her sculptures that is explored in a mature and spiritual manner. The dichotomy of masculine and feminine forces is often represented in unity. The masculine archetype of the seed is enveloped by the loving and protective womb of the pod while at the same time many of the pods, though apparently performing feminine roles, are phallic in shape. There are exceptions to this; “Black Pod I” and “Black Pod II” are examples. The pod shapes in these two pieces are rounded in form. They retain their femininity in appearance and in their perceived function. When examining these two pieces one cannot help but to be reminded of deep space as an incubator of celestial bodies and crucible of life while simultaneously appreciating the simplicity of the pod itself as a representation of something more terrestrial and familiar. It is intriguing how forms of simple, elegant beauty can engage the imagination of the viewer when confronted with the archetypal symbolism present in a work of art. In all, I find T.J. Mabrey’s work to be very interesting on a number of different levels. It is sophisticated in style and concept. Her work is socially stimulating but also allows one to contemplate lofty spiritual ideals on a very personal level. Aesthetically speaking, her use of texture is visually engaging as it ranges from highly polished, smooth areas to incredibly detailed surfaces. This allows a dynamic play of light and shadow, a reflection of nature that seems to be present in every nuance of Mabrey’s work; which is something that I think people from any walk of life can appreciate. Mabrey’s work will engage the eye and the mind. With every curve and crevice of her work, the viewer will sense the same rhythms of nature that initially inspired the pieces and guided our ancestors through the long journey of evolution. With the sensing of those rhythms one comes into a new appreciation for the humble seed that has been with us though the ages.